In 1978, Pope John Paul I died just 33 days into his papacy. When it emerged that on the eve of his death, he had told several cardinals hostile to his planned reforms that he was removing them from Rome, there were suspicions of foul play. The mystery has all the makings of a fascinating drama but The Last Confession by Roger Crane, an American lawyer and first-time playwright, is a rather stolid, old-fashioned play, which only fires intermittently. The main draw-card is that it stars David Suchet (of Poirot fame) – and he doesn’t disappoint. 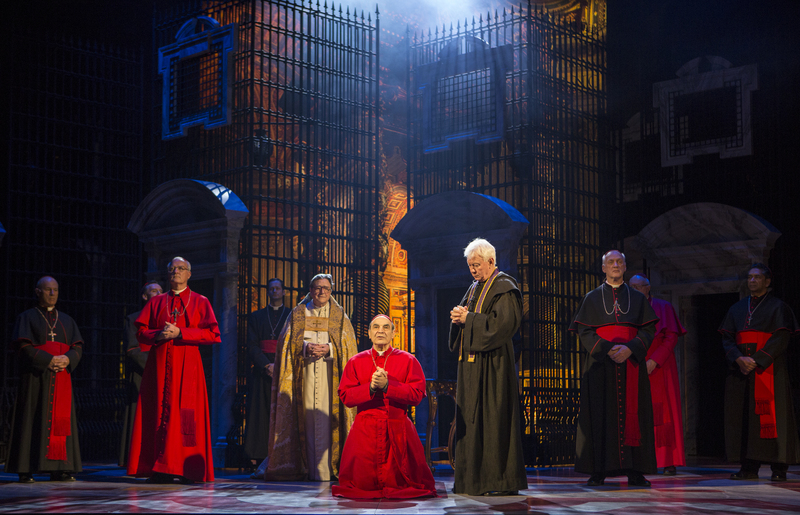 Suchet plays Cardinal Giovanni Benelli, who engineers the election of his friend Cardinal Albino Luciani to the papacy and then suffers a crisis of faith after his death. Directed by Jonathan Church on William Dudley’s grandiose set, the play starts slowly, with a long stretch of un-dramatic dialogue taking an age to set things up. It only comes to life when Luciani becomes Pope and locks horns with intransigent, conservative members of the Roman Curia. Benelli’s investigation into the Pope’s death in Act II is also lively. But the play frequently gets bogged down in long, wordy debates. Fortunately the international cast of 20 are all extremely good. Suchet is a charismatic presence and uses his rich, velvety voice to great effect in a powerful, if slightly mannered, performance. Richard O’Callaghan is also a standout as the gentle, humble, morally upright yet determined “people’s Pop” John Paul I who wants to bring the Catholic Church into the 20th century. The Last Confession offers a peek into the machinations of the Catholic Church and the corrupt power of the Vatican bank. With a shorter, sharper script it could be intriguing.